For the preparation of the leaf used steel of 1.2 mm on both sides, internal aislament with module consists of rockwool and/or fibrosilicate, with appropriate required density for fire resistance with different thickness depended of the fire resistance of the door, 55-85-105 mm. 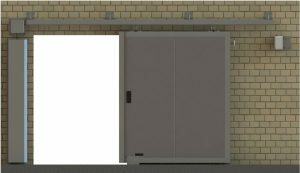 Normally the door is manufactured in modules of 1000 mm wide by high hollow necessary (but it is possible to made in special dimensions). All the modules of the door are assembled by galvanized steel 1.8 / 2 mm “U” system in all of the perimeter of the door. All the doors are with special intumescent joint-gasket in the perimeter. The hardware of the door are made with a high quality steel and they are adjustable in all three spatial planes X, Y, Z. Normally the open and closing system of the door is made by a manual door opening combined action of electromagnet. There is a possibility to automate the door for to open and close by a motor and control panel using a electrically controlled.